The team running on the railroad to Tazmily Village. The sequel of Earthbound, who was never translated in english for a very long time and now it seems that it will be officially localized soon. 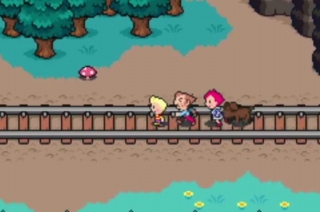 Mother 3 tries to bring another chapter to the Mother series and doesn’t fail in doing so! But beware! 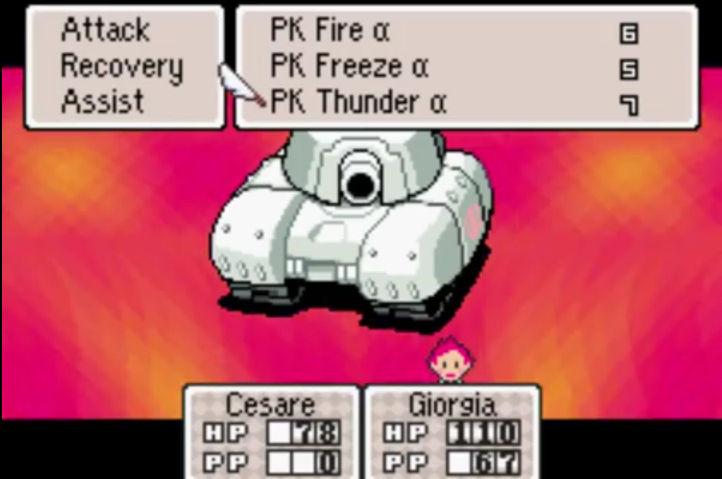 If you are faint of heart don’t play Mother 3! Its story is considered by many to be one of the saddest stories in videogames so you’ve been warned! Anyway Mother 3 is an RPG, exactly like Earthbound. And like Earthbound, it uses some of its mechanics like the use of PSI, a psychic energy that can be used only by those destined to use it. It includes the famous “rolldown” mechanic (I talk about this in more depth in my Earthbound page). Like its predecessors it uses to give characters weapons like sticks, gloves, shoes and other things. The story of Mother 3 is divided into 8 chapters, and tells about two young siblings, Lucas and Claus, who live with their parents on the peaceful Nowhere Islands. But something is focused on breaking this peace for some reason and someone needs to fight back. First is Lucas and Claus’ father, Flint, to take the bargain. Then is Duster, the thief of justice and finally Lucas. Fighting a huge tank might prove to be an hard challenge without PSI. The progression of the game is way more story driven than Earthbound. In Mother 3 you are restricted of following the chapter progression and as you do so, some areas will be locked out for you to explore in future chapters. In Earthbound the world was pretty much always open, except if you saved in the final area in which case it would have been impossible to go back. In Mother 3 there are lots of what I call “points of no return” that after are passed, lock-out a certain area forever. Some of those areas are pointless but some contain rare items you really don’t want to miss out. There, I will give you an almost-spoiler-free list of those points. Am I kind or not? 1- Chapter 2, Dragon Pleateau: If you defeat the boss, you won’t be able to return there or play as Flint anymore. 2- Chapter 4: If you reach Tazmily the desert area will be locked-out forever. 3- Chapter 5, Top of Thunder Tower: if you defeat the boss you won’t be able to return to Thunder Tower anymore. 4- Chapter 7: Pulling Needle #2 prevents you to use Salsa again. Get his inventory back before you pull it. 5- Chapter 7: If you defeat the boss in front of Needle #6, the whole “main world” will be locked-out. 6- Chapter 8: Defeating the boss at the top of the skyscraper, locks you in the final area. There are so many of those! And it’s really a shame that so many areas get locked-out like this, it would have been fun to explore them with other characters but, oh well. The chapters with most map to explore are Chapter 5 and 7, where you can explore most of the Nowhere islands. But apart from that, Mother 3 takes back the weird humor that made Earthbound famous. The weird jokes and puns make the game more fun and more real as it makes the NPCs and the main characters more realistic. It feels like they are really real persons and not just a bunch of pixels thrown here and there. Most of the townsfolk have a name that you can see when talking to them, as you meet them later in the game, you start to know more about what happened to them. The game wants you to care about those NPCs because they are people too, with their own story to tell. I hope that made you want to play Mother 3. Don’t worry if you haven’t played Earthbound or Mother, it’s not necessary. The stories are disconnected enough so they can be played without having seen the previous titles. Of course if you played the predecessors you will see some connections.